Table Size: 72 x 48 inches approx (LxB) ; Chair Size: 20″ inches Height Approx. Handmade / Handcrafted Wooden Dining Sets For Kitchen Furniture By Aarsun Woods. Comfortable, affordable and simple to care for, the traditionally designed wooden Dining Table is a great match for many different lifestyles. The rich, teak wood and smooth finish contrast well with a range of colour schemes, and with a handcrafted finish it’ll certainly last for long. You can design and decorate your dining room by shopping beautiful 6 Seater dining table sets wooden furniture. 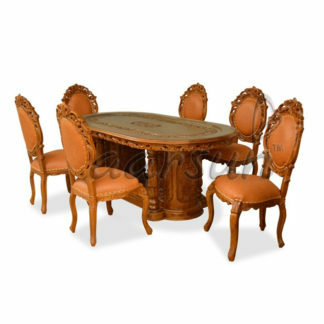 A comfortable, stylish and furnished set which can be purchase online at Best price.Extracted from the Teak wood, the oak finish makes it look very clean and impressive Solid wood six seater dining table and chair are available in various trendy shape like square, rectangular, circular and oval.An elegant panache sturdy furniture can make your home come alive. Looking for a different material design in Wooden Dining Sets , have a look at Traditional Wooden Dining Table set,also in case you require fine carving in Dark Walnut Finish, go for Handmade Wooden Dining Set.